The fiercest and the bloodiest battle of the so-called War of 1812 took place on July 25, 1814, and is known as the Battle of Lundy’s Lane. 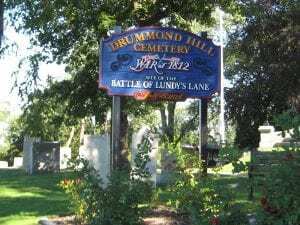 Part of that battlefield in Niagara Falls, Canada, is occupied by Drummond Hill Cemetery—an allegedly haunted place I investigated in 2002 for a local TV channel. According to an often-repeated claim, soldiers are seen “from time to time,” limping across the field and then disappearing. Presumably they fell during the historic battle, being represented as “a ghostly formation of five old soldiers who are dressed in the manner of the Royal Scots” (Colombo 1988, 181–182). The evolving tale has different versions (what folklorists call variants). One, for example, does not specify the number of soldiers, and states that they are dressed both as Royal Scots and British Red-Coats. Only “Some are limping . . . as they trudge up the hill, sadly walking into battle” (“Drummond” N.d.). One nighttime ghost hunter even heard “some folks running” with what “sounded like boots,” and “a faint yelling of men in the distance of the cemetery.” However, for all we know, if not imagined these were likely sounds interpreted from the surrounding city. And there were luminous patches of mist in the ghosthunters’ photos—not “ecto plasm” (sic) as they think, but only their camera’s flash highlighting some real source of mist (as from the night air, their breath, or cigarette smoke, etc.). Brady, George, and Cathy Brady. 2003. The Drummond Hill Cemetery. Online at https://hamiltonparanormal.com/drummond2.html . Accessed July 7, 2018. Colombo, John Robert. 1988. Mysterious Canada. Toronto: Doubleday Canada Ltd.
———. 1999. Mysteries of Ontario. Toronto: Hounslow Press. “Drummond Hill Cemetery: A Haunted Graveyard.” N.d. Online at articles.ghostwalks.com/drummond-hill-cemetery. Accessed July 17, 2018. “The Paranormal Profilers.” N.d. Online at theparanormalprofilers.com/place/drummond-hill-cemetery/. Accessed July 18, 2018.